2006-02-22 Application filed by Dow Global Technologies Inc. filed Critical Dow Global Technologies Inc. The instant invention is an improved cure system composition and a method for curing chlorinated elastomer compositions. The cure system composition includes a polymercapto crosslinking agent; an inorganic base; and an onium salt. The onium salt has a formula selected from the group consisting of formula (I) and formula (II); wherein Z is a nitrogen or phosphorous atom, R1 to R4 are independently alkyl or aryl groups containing between 2 and 8 carbon atoms, and the total number of carbon atoms on R1-R4 is between 10 and 14; wherein R5 and R6 are alkyl groups containing between 1 and 8 carbon atoms, and the total number of carbon atoms on R5-R6 being between 5 and 9; and wherein X is an anion. The method for curing a chlorinated elastomer composition according to instant invention includes the following steps: (1) providing a chlorinated elastomer composition; (2) providing a cure system composition as described above; (3) contacting said chlorinated elastomer composition with said cure system composition; and (4) thereby curing said chlorinated elastomer composition. The instant invention relates to an improved cure system composition and a method for curing chlorinated elastomer compositions. This application is claiming priority from U.S. Provisional Application Serial No. 60/661,594, filed on March 14, 2005 entitled "Vulcanizable Chlorinated Elastomer Compositions with Improved Processing Safety," the teachings of which are incorporated by reference herein as if reproduced in full hereinbelow. Chlorinated elastomers may be cured by numerous means including the use of peroxide/coagent systems, thiadiazole-based systems, or irradiation crosslinking techniques. Peroxide cures are typically preferred for their scorch safety, shelf-life or bin stability, low permanent set, and high temperature performance. However, peroxide cure systems are often unacceptable for use in molded goods because of mold sticking and fouling due to volatiles or in applications that require a low temperature cure due to equipment or processing limitations. Thiadiazole-based cure systems provide certain advantages such as the ability to cure over a wider range of temperature and pressure conditions than peroxide cures while generating fewer volatile byproducts, having good mold release characteristics, and the ability to use less expensive compounding ingredients such as aromatic oils. U.S. Patent No. 4,128,510 discloses that halogen containing polymers can be crosslinked by employing a cure system including 2,5-dimercapto- 1,3,4- thiadiazole (or its derivatives) and a basic material such as a metal oxide, metal hydroxide, or metal carboxylate. It further discloses that the addition of an accelerator containing aliphatic or aromatic amines or quaternary nitrogen groups may be desirable; additionally, the condensation product of butyraldehyde and aniline is described as being a particularly useful accelerator. U.S. Patent No. 4,288,576 discloses 2,5-dimercapto-l,3,4-thiadiazole (and derivatives thereof) curing systems for saturated halogen containing elastomers, for example chlorinated polyethylene, wherein the curing systems specifically include certain vulcanization accelerators. Classes of accelerators include: 1) amines having a boiling point above 110° C and pK values below about 4.5; 2) salts of amines with pK values below 4.5 and acids having pK values above 2.0; 3) quaternary ammonium hydroxides and their salts with acids having a pK above 2.0; 4) diphenyl- and ditolyl- guanidines; and 5) the condensation product of aniline and mono-aldehydes containing one to seven carbon atoms. The presence of at least an equal amount of an inorganic base is additionally required. Despite the excellent vulcanizate properties obtainable with the polymercapto/inorganic base/accelerator-based vulcanization systems for chlorinated elastomers, two key problems remain that limit their usefulness. The first problem is the premature vulcanization of the compound during storage (that is, poor bin stability) or during processing (that is, poor scorch safety) prior to forming the vulcanized article. The second problem is the inconsistency of the vulcanization rate. It is desired that the elastomer compound, after preparation, be stable under typical environmental conditions of storage and during processing of the compound such that minimal vulcanization occurs prior to formation of the finished article. A consistent vulcanization rate is desired so that processes that form the finished vulcanized article, for example injection molding, extrusion, or compression molding can be run consistently and without the generation of scrap materials. U.S. Patent No. 4,745,147 discloses curable compositions of a chlorinated polyethylene, a polymercapto crosslinking agent, an acid acceptor, and a polyhydric alcohol. The composition must also contain a cure initiator such as an amine, a quaternary ammonium salt or a quaternary phosphonium salt (collectively hereinafter referred to as "onium salt"). The onium salts are of either the formula R1R2R3R4Z+ Cl" or the chloride salt of an N-substituted pyridinium ion, wherein Z is N or P; R1-R4 may be the same or different from each other and selected from C1-17 alkyl, cyclohexyl, phenyl and benzyl groups. The polyhydric alcohol is said to improve the cure state and heat aging of crosslinked compositions. U.S. Patent Nos. 5,665,830 and 5,686,537 disclose that variability in the premature curing (scorch) of the 2,5-dimercapto-l,3,4-thiadiazole, amine/quaternary ammonium salt, metal oxide cure system is due to the influence of water and that the variation can be eliminated by addition of polyethylene glycol or glycerin. U.S. Patent No. 4,482,681 discloses polymercapto cure systems containing an organic or inorganic base, and a hydrated salt, which releases its water during curing. The hydrated salt improves the cure rate. Some chlorinated elastomers also require an accelerator, which may be an amine or a quaternary ammonium salt. Despite the research efforts in developing and improving in the scorch safety and cure rate reproducibility, there is still a need for further improvement in scorch safety while maintaining an acceptable cure rate. wherein Z is a nitrogen or phosphorous atom, R1 to R4 are independently alkyl or aryl groups containing between 2 and 8 carbon atoms, and the total number of carbon atoms on R1- R4 is between 10 and 14; wherein R5 and R6 are alkyl groups containing between 1 and 8 carbon atoms, and the total number of carbon atoms on R5-R6 being between 5 and 9; and wherein X is an anion. The method for curing a chlorinated elastomer composition according to instant invention includes the following steps: (1) providing a chlorinated elastomer composition; (2) providing a cure system composition as described above; (3) contacting said chlorinated elastomer composition with said cure system composition; and (4) thereby curing said chlorinated elastomer composition. The cure system composition according to instant invention includes a polymercapto crosslinking agent, an inorganic base, and an onium salt. Additionally, a curable chlorinated elastomer according to instant invention includes a chlorinated elastomer, and a cure system composition including a polymercapto crosslinking agent, an inorganic base, and an onium salt. Any polymer or copolymer containing chlorine atoms, which can be compounded to form an elastomeric product after crosslinking, can be considered a chlorinated elastomer for the purposes of this invention. Examples of chlorinated elastomers include, but are not limited to, polychloroprene, polyepichlorohydrin, epichlorohydrin/ethylene oxide copolymers, chlorosulfonated polyethylene, chlorinated butyl rubber, and chlorinated polyethylene. Chlorinated and chlorosulfonated polyethylene are especially preferred in the compositions of this invention because such elastomers are more difficult to dehydrochlorinate than the other elastomers listed above; thus, they are more sensitive to differences in accelerator. Inorganic bases suitable for use in the compositions of this invention include, but are not limited to, metal oxides, metal hydroxides, or their salts with weak acids. The inorganic base acts as an acid acceptor to capture the hydrochloric acid that is formed as a byproduct of the curing reaction. Typical metals include, but are not limited to, those of Group IIA of the Periodic Table, such as Mg, Ca, or Ba. Specific examples of these compounds include, but are not limited to, magnesium oxide, magnesium hydroxide, calcium oxide, calcium hydroxide, barium hydroxide, magnesium carbonate, calcium carbonate, barium carbonate. Preferred basic metal oxides and hydroxides are magnesium oxide and magnesium hydroxide. The basic metal oxides are generally incorporated at levels of 2-10 parts per hundred parts (phr) of the chlorinated elastomer. wherein Z is either a nitrogen atom or a phosphorous atom, each OfR1-4 is independently an alkyl or aryl group containing between 2 and 8 carbon atoms and wherein the total number of carbon atoms on R1-4 is between 10 and 14 carbons, R5 and R6 are alkyl groups containing between 1 and 8 carbon atoms and the total number of carbon atoms on R5-R6 is between 5 and 9. Preferred aryl groups are benzyl or phenyl. The anion, X", of the onium salt may include, but is not limited to, chloride, bromide, hydrogen sulfate, acetate, fluoride, dihydrogen phosphate, and other anions, which form stable quaternary ammonium or phosphonium salts. Aromatic heterocyclic quaternary ammonium and phosphonium salts, wherein the nitrogen or phosphorous atom is part of the ring, are not considered accelerators for use in the compositions of this invention. Particularly useful quaternary ammonium compounds are tetrapropylammonium bromide and triethylhexylammonium bromide. Compositions of the present invention may include other ingredients commonly employed in rubber vulcanization such as fillers, extenders, plasticizers, stabilizers, and pigments. The properties of the final vulcanizate can be adjusted by addition of these materials to suit the application. Examples of common fillers are calcium carbonate, carbon black, or clay. Extenders and plasticizers are usually aromatic or napthenic oils or esters. A typical pigment is titanium dioxide. The curable compositions of this invention have a combination of good process safety (low scorch and good bin stability) and relatively fast and reproducible cure rates. 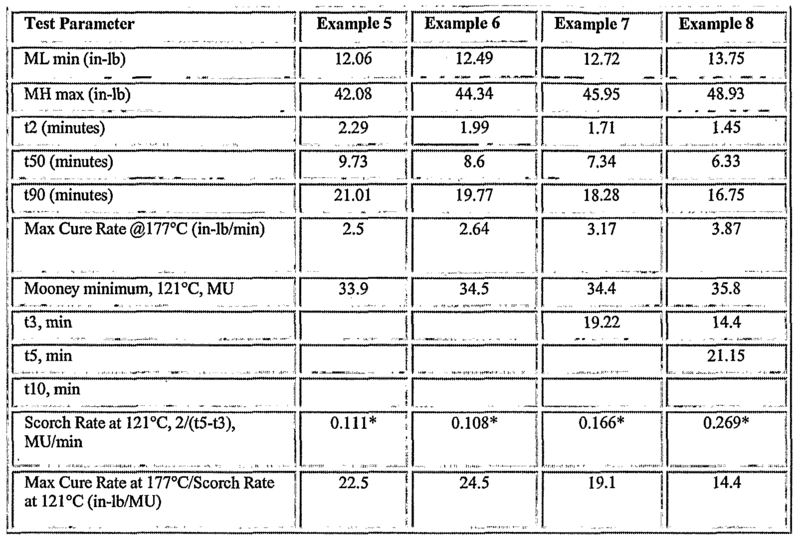 Typically a scorch rate (see Test Methods) of less than 0.35 Mooney units (MU) per minute is considered safe. A cure rate (see Test Methods) of at least 3 in-lb per minute (3.4 dN-m/minute) is considered acceptable. The ratio of cure rate to scorch rate is a convenient parameter that may be employed to describe a cure system. For most processes, a ratio of at least 13 in-lb/MU (14.7 dN-m/MU) is acceptable. Typical end use applications for the curable compositions of this invention include automotive and industrial hose, wire and cable jackets, vibration isolators, flexible boots for mechanical joints, roller covers, seals, and gaskets. The ingredients of the curable chloroelastomer composition are typically mixed and uniformly blended with the chlorinated elastomeric polymer by use of a high intensity internal mixer such as a Banbury® (Farrel Corporation) mixer. They may also be incorporated by milling on a two roll mill or by any other mechanical mixing device from which a uniform blend of the ingredients can be derived. It is preferable to mix the ingredients of the elastomeric composition such that the temperature of the composition does not exceed about 110 0C and the time of the mixing is maintained as short as is necessary to achieve a uniform composition. The mixing process may be improved by adding some of the ingredients in a binder. For example, reaction accelerators can be bound in a polymer such as ethylene-propylene-diene rubber at concentrations of 25-75 percent of the accelerator, thus making addition of small amounts of ingredient easier to handle. Whether the ingredients are added neat or in binders does not materially affect the results of this invention. The conditions under which the elastomeric compound is crosslinked into the elastomeric product range from temperatures of from 130 °C to 200 °C and from atmospheric to high pressures, such as those encountered in compression or injection molding. The time for the crosslinking reaction to take place varies with the temperature and the concentrations of polymercapto compound, accelerator, and metal oxide in the composition. Lower temperatures and lower concentrations require longer times for the finished part to be crosslinked. Typical crosslinking times may be from 1 minute to several hours. Cure rate testing was accomplished according to ASTM D2084 on a Monsanto Oscillating Disk Rheometer (ODR) at 177 0C for 30 minutes. Evaluation for processing safety was accomplished according to ASTM D 1646 on a Monsanto MV2000E using changes in the Mooney viscosity over the course of a 25 minute test at 121°C. For the ODR testing, ML and MH refer to the minimum and maximum torques measured during the test. The t2, t50, and t90 parameters are the time for the torque to change 2 percent, 50 percent, and 90 percent of the difference between MH and ML. The maximum cure rate was obtained directly from the slope of the ODR curve by calculating the slope of the curve from point to point and taking the maximum value of the slope. The following examples illustrate the present invention but are not intended to limit the scope of the invention. The examples of the instant invention demonstrate that high vulcanization rates can be maintained while improving the processing safety of the compound by choosing the quaternary ammonium or phosphonium salt accelerator in accordance with the present invention. I Tetrahexylammonium bromide9 0.45 oo I Tetraheptylammonium bromide10 I __ o.5 ; . .
1 Tyrin® CM0836 available fiorn DuPont Dow Elastomers L LC. 2 N-774 available fixim Sid Richardson Carbon Co.
4 Sundex® 790T available from Sunoco, Inc. 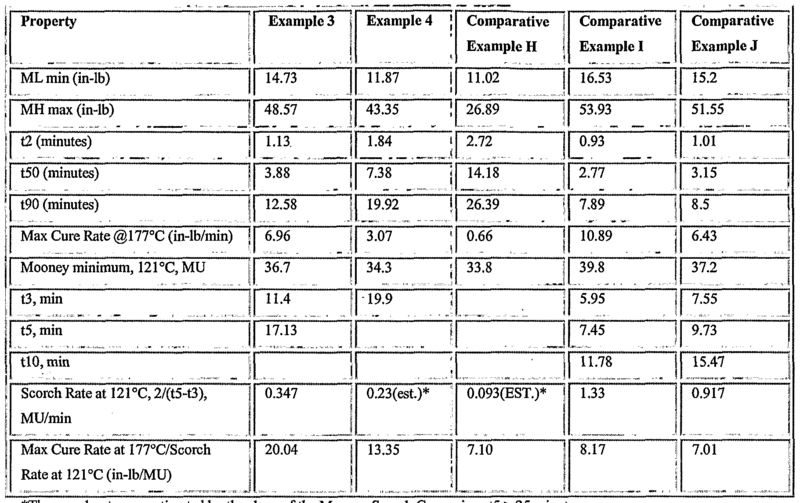 The cure rate and processing safety data of compositions containing quaternary ammonium bromides as accelerators, Examples 1 and 2, and Comparative Examples A-G are listed in Table II. The ratio of the maximum cure rate/scorch rate can be used to estimate the quality of the accelerator. Accelerators that give fast cure rates but good processing safety will have high ratios. From Table II, it can be clearly seen that the Examples of the present invention have the highest ratios of cure rate/scorch rate and are preferred accelerators. Additional examples were prepared using tetrapropylammonium chloride and iodide versus comparative examples containing tetraethylammonium iodide and tetrabutylanimonium chloride and iodide. 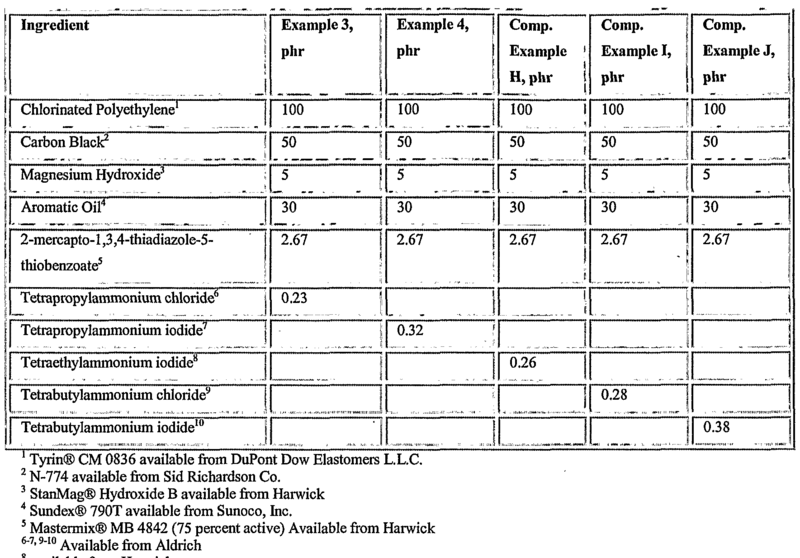 The composition of Examples 3 and 4, and that of Comparative Examples H, J, and I are listed in Table III. The cure rate and processing safety data for these compositions are listed in Table IV. The ratio of the maximum cure rate/scorch rate is clearly higher for the examples of the present invention. Compositions of the invention containing pyroUidinium chlorides or bromides as cure accelerators were made by the same process that was employed to prepare Examples 1-4 above. 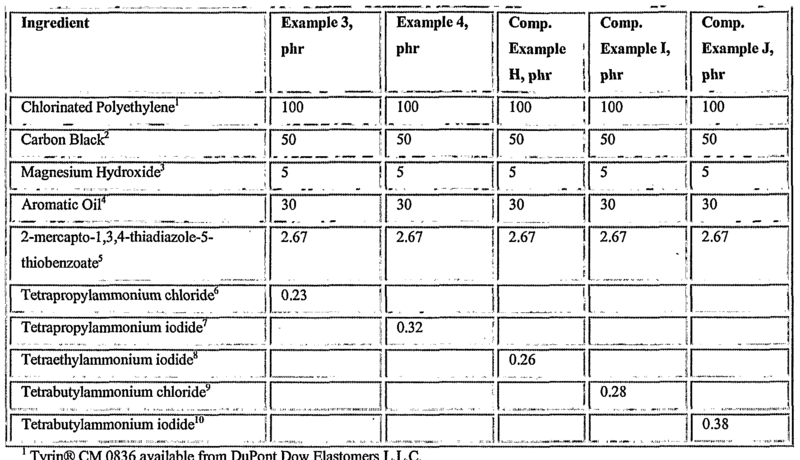 The formulations are shown in Table V. Cure rate and processing safety parameters are given in Table VI. 1 Tyrin® CM 0836 available from DuPont Dow Elastomers L.L.C. 2 N-774 available from Sid Richardson Co.
wherein Z is a nitrogen or phosphorous atom, R1 to R4 are independently alkyl or aryl groups containing between 2 and 8 carbon atoms, and the total number of carbon atoms on R1-R4 is between 10 and 14, wherein R5 and R6 are alkyl groups containing between 1 and 8 carbon atoms, and the total number of carbon atoms on R5-R6 being between 5 and 9; and wherein X is an anion. 2. The cure system composition according to Claim 1, wherein said polymercapto crosslinking agent being a crosslinking agent selected from the group consisting of 2,5-dimercapto-l,3,4-thiadiazole and a derivative thereof. 3. The cure system composition according to Claim 1, wherein said polymercapto crosslinking agent being 2-mercapto-l,3,4-thiadiazole-5- thiobenzoate. 5. The curable chlorinated elastomer composition according to Claim 4, wherein said chlorinated elastomer is selected from the group consisting of polychloroprene, polyepichlorohydrin, epiclilorohydrin/ethylene oxide copolymers, chlorosulfonated polyethylene, chlorinated polyethylene, and chlorinated butyl rubbers. 6. The curable chlorinated elastomer composition according to Claim 5, wherein said chlorinated elastomer is chlorinated polyethylene. 7. The curable chlorinated elastomer composition according to Claim 4, wherein said polymercapto crosslinking agent is selected from the group consisting of 2,5-dimercapto- 1 ,3 ,4-thiadiazole and a derivative thereof. 8. The curable chlorinated elastomer composition according to Claim 4, wherein said polymercapto crosslinking agent is 2-mercapto-l,3,4-thiadiazole-5- thiobenzoate. 9; and wherein X is an anion. 10. The article according to Claim 9, wherein said chlorinated elastomer is selected from the group consisting of polychloroprene, polyepichlorohydrin, epichlorohydrin/ethylene oxide copolymers, chlorosulfonated polyethylene, chlorinated polyethylene, and chlorinated butyl rubbers. 11. The curable chlorinated elastomer composition according to Claim 10, wherein said chlorinated elastomer is chlorinated polyethylene. 2,5-dimercapto-l,3,4-thiadiazole and a derivative thereof. 13. The curable chlorinated elastomer composition according to Claim 10, wherein said polymercapto crosslinking agent is 2-mercapto-l,3,4-thiadiazole-5- thiobenzoate. 9; and wherein X is an anion; contacting said chlorinated elastomer composition with said cure system composition; and thereby curing said chlorinated elastomer composition. 15. The method of curing a chlorinated elastomer composition according to Claim 14, wherein said chlorinated elastomer composition and said cure system composition being admixed. 17. The method of curing a chlorinated elastomer composition according to Claim 14, wherein said chlorinated elastomer is selected from the group consisting of polychloroprene, polyepichlorohydrin, epichlorohydrin/ethylene oxide copolymers, chlorosulfonated polyethylene, chlorinated polyethylene, and chlorinated butyl rubbers. 18. The method of curing a chlorinated elastomer composition according to Claim 17, wherein said chlorinated elastomer is chlorinated polyethylene. 19. The method of curing a chlorinated elastomer composition according to Claim 14, wherein said polymercapto crosslinking agent is selected from the group consisting of 2,5-dimercapto- 1 ,3 ,4-thiadiazole and a derivative thereof. 20. The method of curing a chlorinated elastomer composition according to Claim 14, wherein said polymercapto crosslinking agent is 2-mercapto- 1,3,4- thiadiazole-5-thiobenzoate.